The new Anderson Auto Group Fieldhouse, part of the Colorado River Union High School District, will be open to the general public in one month. Exterior signage was installed Friday with the name of the corporate title sponsor. Grand opening ribbon cutting ceremonies are scheduled for 10:00 a.m. on Saturday, March 2. Tours, family-friendly activities and demonstrations of how different parts of the facility can be used and rented will be ongoing until 2:00 p.m. Refreshments will be both free and available for purchase. Students from River Valley and Mohave High Schools will use the voter-approved indoor arena for many football and soccer games. Other local and regional athletic events are being scheduled. Career/technical education classrooms can be converted to conference and meeting rooms and will be available to rent for activities ranging from workshops and symposiums to wedding receptions and quinceañeras. The 80,000 square foot artificial turf field can be covered for wrestling, basketball, pickleball and volleyball tournaments, or trade shows and conventions. Mohave High’s award-winning Thunder Band will greet visitors in the parking lot. The Air Force Junior ROTC will present colors. Students and faculty from both Mohave and River Valley will be on hand to assist visitors. The Anderson Auto Group Fieldhouse is located at 3663 Bullhead Parkway, at the far southwest end of the Parkway, west of Arizona State Route 95. Paved parking is on the south side of the Fieldhouse immediately adjacent to the Parkway, and overflow parking is on the north side. If necessary, there is additional parking a short distance away at the Crossroads Shopping Center, which will be about a two block walk. Because of the large turnout expected, CRUHSD officials have encouraged visitors to arrive early and allow extra time for parking. Businesses interested in corporate sponsorships or Fieldhouse rentals may contact the District at 928-758-3961, x-1430. 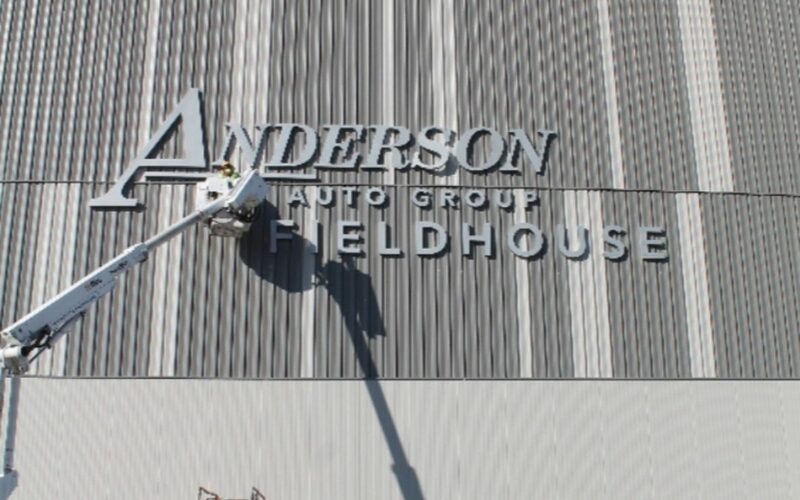 Additional information about the ribbon cutting will be posted on the Fieldhouse website, HYPERLINK “http://www.andersonautogroupfieldhouse.com” www.andersonautogroupfieldhouse.com, and the school district’s Facebook page, @crsk12az or coloradoriverschools.